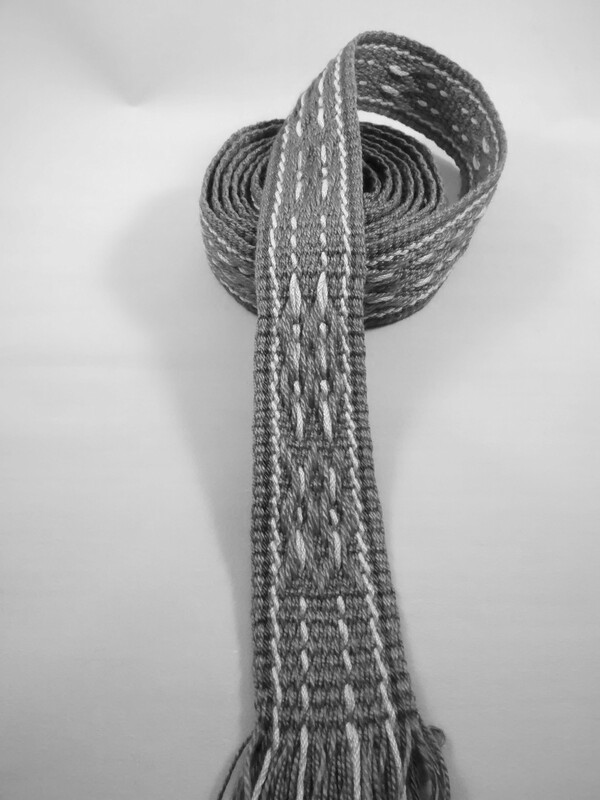 I’ve been doing some Baltic pickup lately, and in that spirit I thought I’d experiment with low value-contrast weaving, since Baltic pick-up weaving has a little bit of texture contrast inherent in it. That’s because the pattern threads are thicker than the background threads, so the texture difference is built-in that way. You could introduce more texture difference by using threads that are actually, you know, a different texture, but I didn’t really do that. 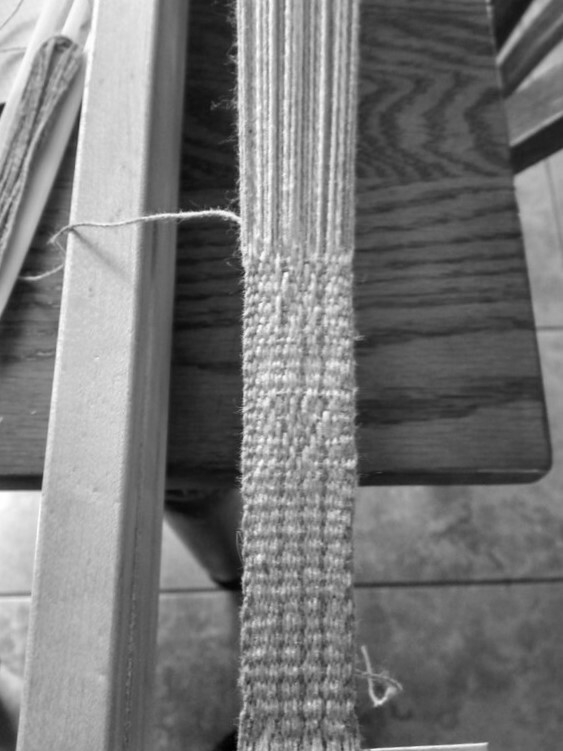 My threads here have a little variation in fiber content, but they’re not too different in texture. A little; not much. There be hearts in there! See ’em? Yeah, I hardly can either. 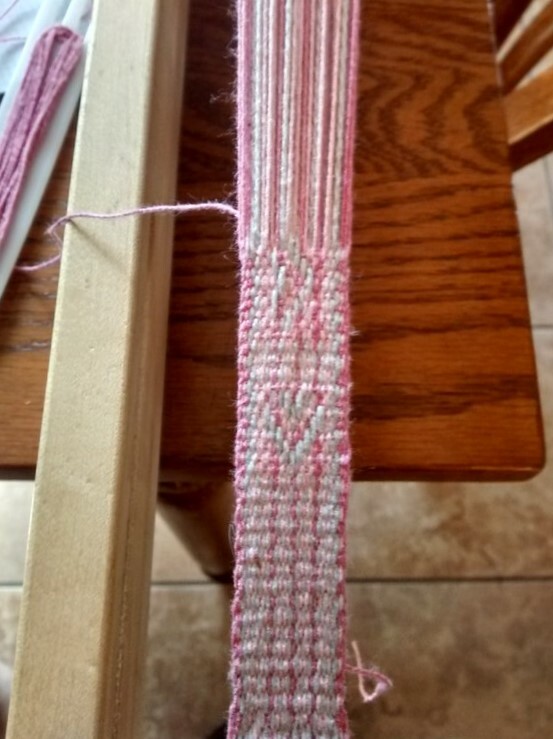 Now, the size difference between the pink background threads and the gray pattern thread is maybe too small, though there is literally a texture difference in the fibers (mercerized vs. unmercerized cotton). In this experiment, the pattern is pretty pointless. There’s no light in which that pattern will pop, and it just looks sort of… unintentional. No dice here! 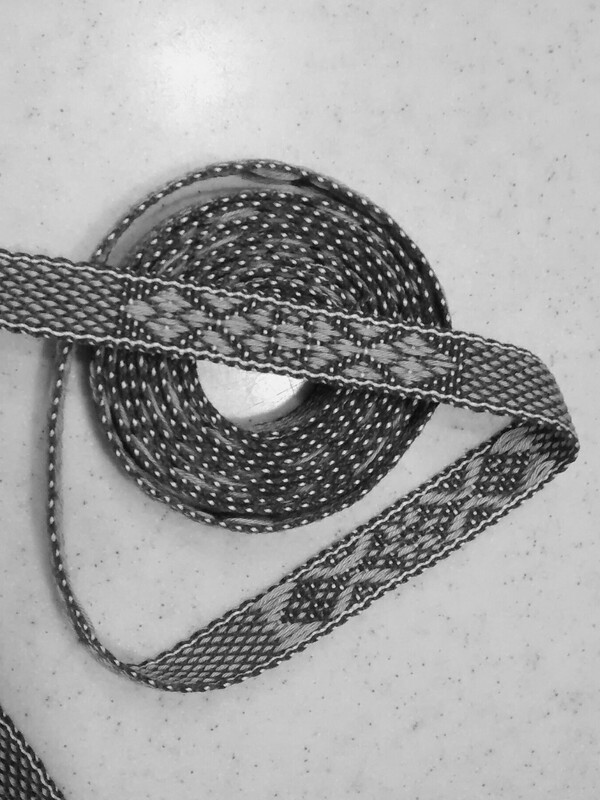 Still in the hunt for some dice, I warped up another Baltic pick-up band, this one with a little more value contrast, but not too strong, and with very heavy pattern warps (the draft is from the article “Patterned Bands from the Sámi Weaving Tradition,” available from Interweave). Click for big. The yellow is the greatest value contrast, but the orange and green are close to the same value (the green is bamboo, by the way, while the rest is mercerized cotton). 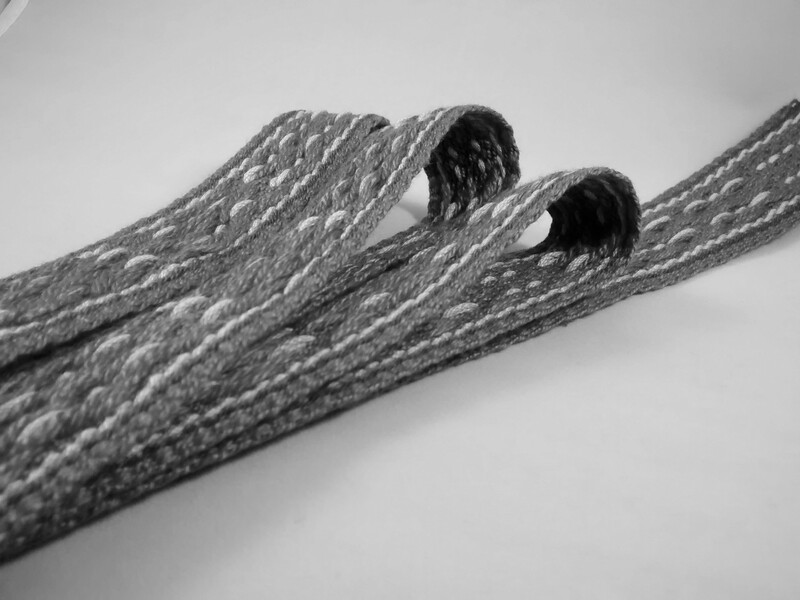 The pattern threads are doubled, so they provide strong texture contrast, as well as being a different fiber, so there is some inherent texture contrast there too. This band is much better. The pattern pops out, but doesn’t go all crazy and jiggly in your eyeballs. It doesn’t stand out in dim light. It is a little wee bit subtle, but not terribly so. It is dice. The value contrast between the blue and orange is a little greater than between the orange and green in the last band, I admit. But I think the real key here is that orange and blue are complementary colors. Now, I know I get no awards for “discovering” that the contrast of complements pops strongly, but I never get tired of how matching complements that are pretty close in value yields a good “pop” without the disturbing “jangle” that you get with color AND value contrasts. I do still have a big ole fat value contrast in there with all the little specks of color from the light blue weft, and I like it. Oh yes, I do. I like it a lot. This pattern shows up in dim light, but it STILL isn’t obnoxious. So there you go. Baltic pick-up does, in fact, allow you to work with lowish-value contrast threads and still get a visible pattern. 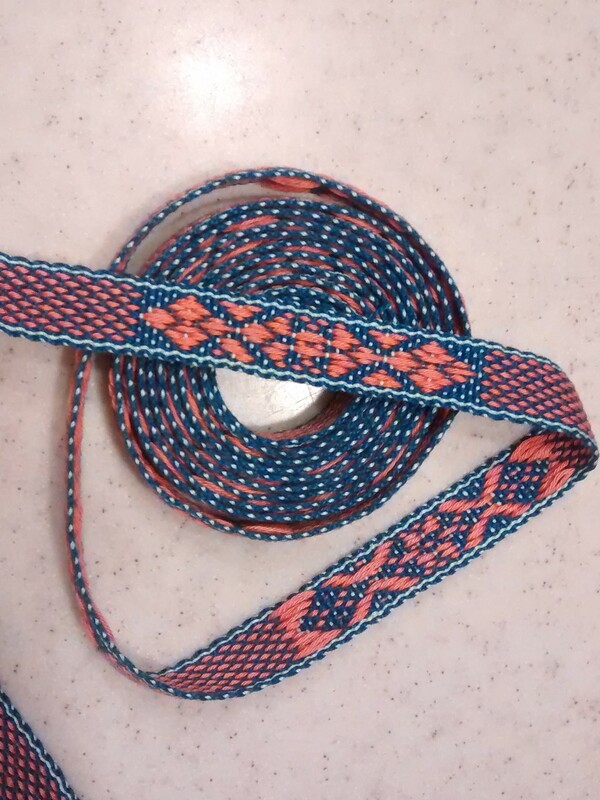 Perhaps I’ll do some other bands in straight pick-up in similar color combinations and see if the pattern is more obscured when you don’t have the texture difference of heavy pattern threads. I hypothesize that it will be, but that’s a lesson for another time.